I’m happy to report that I’ve completed my first year of library school, and at the moment I’m spending some time with my parents in Toronto before I start my summer job in Ottawa on May 1st. Looking back over my year, I decided that now would be a good time to write a personal post about my experiences leading up to my MLIS program. I’m not sure that my story is typical of library school students, but then again, it seems that we come from a pretty wide variety of backgrounds. I received my BA in psychology from UBC in the spring of 2006 (two whole years ago – wow!). At that point, I had never considered library school; I was vaguely aware of the field of “library science,” but I had no idea that being a librarian required a Master’s degree. 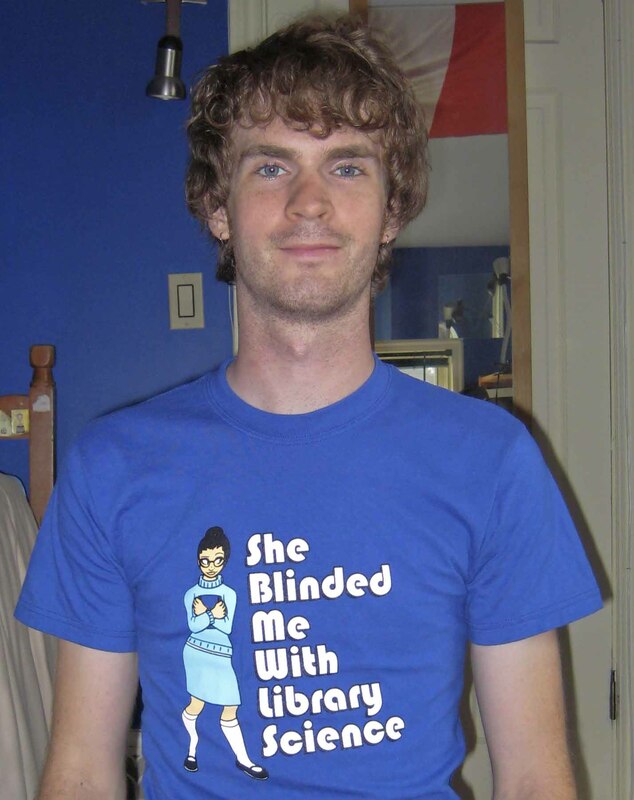 To be perfectly honest, my main use of the public library was as a free DVD rental service, and I only went to the UBC libraries when I was performing research that couldn’t be done through their online services. Upon graduation, my plan was to pursue graduate studies in social psychology. Fortunately, the other part of my plan was to take a year off, in order to write the dreaded GREs, put some time into my grad school applications, and then spend the rest of the year living in Paris and working on my French. I say fortunately because, looking back, I now realize how important that year was in terms of figuring out what I really wanted to do with myself. In many ways that year was disappointing (I spent months studying for a test that I didn’t end up needing at all, and I had to cut my time in Europe short), but it was entirely necessary, and I would implore anyone thinking about going straight from undergrad to grad school to consider taking some time off in between. No joke – that’s really how the idea of library school occurred to me. I saw it on a t-shirt design. Fortunately, I still had time to apply. I actually didn’t spend much time comparing schools. I’d been wanting to live in Montreal for a long time, and I knew McGill was a prestigious school (in general, not necessarily for its library school in particular), so it was my first choice and in early 2007 I was accepted. Whew. I think that’s enough for now, but at some point I will move on to my reflections about library school itself. I hope the weather is as nice where you are as it is in Toronto right now! there is indeed evidence that kids who come to the library for gaming also use the book collection more. At ALA’s 2008 Midwinter Meeting, Julie Scordato from the Columbus Metropolitan Library gave a presentation with some evidence, starting on slide 6. I wrote the new issue of Library Technology Reports about Gaming in Libraries, and I specifically included a case study about a middle school in Virginia that has tied gaming to the statewide reading club, which doubled the number of participants in the first year. I was never interested in Twitter because, well, I don’t care what my Internet friends had for breakfast. But in the spirit of not knocking it until I’ve tried it, I’ve set up an account. The only problem is that I have no one to Twitter to (no followers, as Twitterites call it), so if anyone wants to know about the things in my life that are too brief (not more than 140 characters at a time) or just not quite inspired enough to merit a blog post, then I encourage you to add me. Follow me, and I promise not to lead you astray. There are certain groups who are more likely to read more than ten books in an average year. Looking at the generations, almost half (47%) of Matures (those aged 63 and older) say they read more than ten books compared to just one-third (33%) of Baby Boomers (those aged 44-62). Women are also more likely to read more than men – 44 percent of women read more than ten books a year compared to three in ten (29%) men. Candidates may not want to try books to reach their partisans, but they may be a good way to reach out to Independents. Just one-third of Republicans (33%) and Democrats (35%) say they read more than ten books in a year compared to 44 percent of Independents. Today’s selection covers many of the usual issues covered by library career books, but it tackles the issue of how today’s young recent grads relate to the library world. The NextGen Librarian’s Survival Guide by Rachel Singer Gordon is a recent (2006) book that draws advice from interviews with librarians as well as responses to a pair of surveys: the Under-40 Survey and the Over-40 Survey. The results of these surveys are used to compare how younger and older librarians feel about the role of young librarians in the field today. For the purposes of the book, Gordon declares “NextGen librarians” to be those who are part of Generation X and Generation Y – that is, anyone born between 1965 and 2000 (though these dates are up for debate). Now, even assuming that we’re not really talking about 8-year-old librarians, this seems like an awfully wide age range to me. I’m not convinced that information professionals in their early forties have more in common with those in their early twenties than with those in their early fifties, but naturally it’s difficult to accurately capture a generational trend. A brief chapter on “Surviving Library School” directs the reader to some appropriate online resources and gives helpful advice on how to make the most of your time as a student. Gordon emphasizes the importance of becoming involved with professional associations and gaining work experience before graduation. Subsequent chapters include “Surviving the Job Hunt” and “Surviving Entry-Level Positions.” Each starts with a list of bullet points outlining the issues unique to NextGen librarians, but the vast majority of the content would be useful to students and recent graduates of any age. Maybe my generation is so self-absorbed that we can’t imagine anyone having different patterns of thinking, but in general I feel that this book is more about students graduating in the 21st century than it is about professionals who were born in a certain era. At any rate, I found it to be helpful, and I would recommend it to all current students and recent graduates. 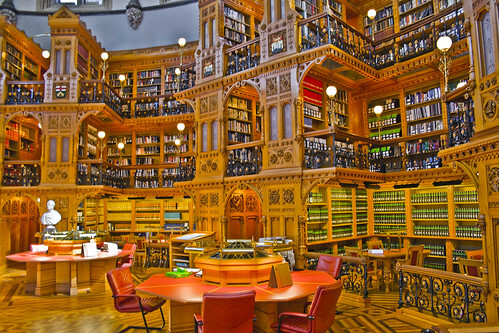 On the weekend, I went to Ottawa with some classmates to visit a few libraries. 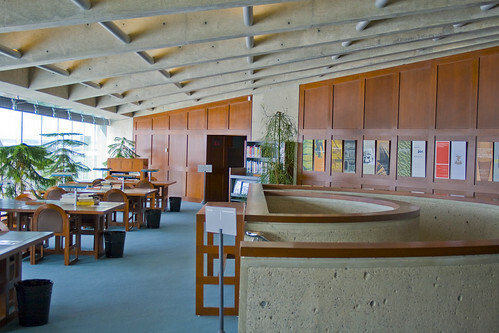 What better way to feel inspired about librarianship than to actually visit some of the most beautiful and interesting libraries in the country? I’m lucky that Montreal is so close to Ottawa, but I’m sure anyone could find some interesting libraries within driving distance. We started with the Library of Parliament, which is absolutely gorgeous, and one of the librarians gave us a full tour, including the less than glamourous but still interesting basement stacks. After lunch, we visited the library at the National Gallery of Canada, which is less impressive architecturally but fascinating from an information perspective (especially for my classmate Rosanne, who has a special interest in art history). The librarian who showed us around even gave us a whole stack of meticulously designed pamphlets advertising past exhibitions. Finally, we were shown around the Ottawa Public Library. More than one of the librarians expressed frustration with the lagging plans for a new facility, and indeed, the building was far from photogenic. We did, however, meet a number of librarians from different departments, each with a unque perspective on the roles of the library, and we left with our bags full of promotional materials for the library so we could learn more about the programs they offer. This was a great opportunity, and I highly recommend organizing this kind of trip. Feel free to let me know about experiences you’ve had touring libraries, and for more photos, click the ones above to find my Flickr stream.